Vimeo had its very first dedicated booth at the NAB show this April. The goal was to create a unique expression of the Vimeo brand that stood out from other NAB presenters and got people talking about and sharing the experience, while also amplifying their new 360 hosting capability. A metal truss that mirrored the footprint of the 'medium island'-sized booth was built. The truss was fitted with Vimeo signage and a 2 foot wire grid. Carrying the 360 brief into more elements of the booth, the team created a custom pixel-sampling LED balloon installation to act as a canopy over the "theater" layout of the booth. A mix of 5', 3' and 2' balloons filled with nitrogen were blown up with the LED strips inside. Power, data, and our balloon map. While balloons started appearing, the rigging crew was working in parallel to help secure the balloons to the grid. Once secured, the balloons were plugged into power and data lines so the LEDs inside could be controlled through a custom program running off a laptop in the storage area. The light installation was split into 3 different "universes". David teeing up the next balloon for universe 3. Identifying the perfect spot in real life, based on our 2d map. As more balloons get hung, it becomes trickier to hang more. David and Niko testing the LED program from the storage area. Riggers on the scissor lift filling in balloons after the truss was brought to trim height. A/V team hanging the first monitor mounts. Ottoman boxes standing in for the custom maple tables. In the final stages the team tested the a/v and LED balloon pixel-sampling. We also used the ottoman boxes to help pre-visualize the final layout before the custom maple tables arrived and everything was unboxed and set up. 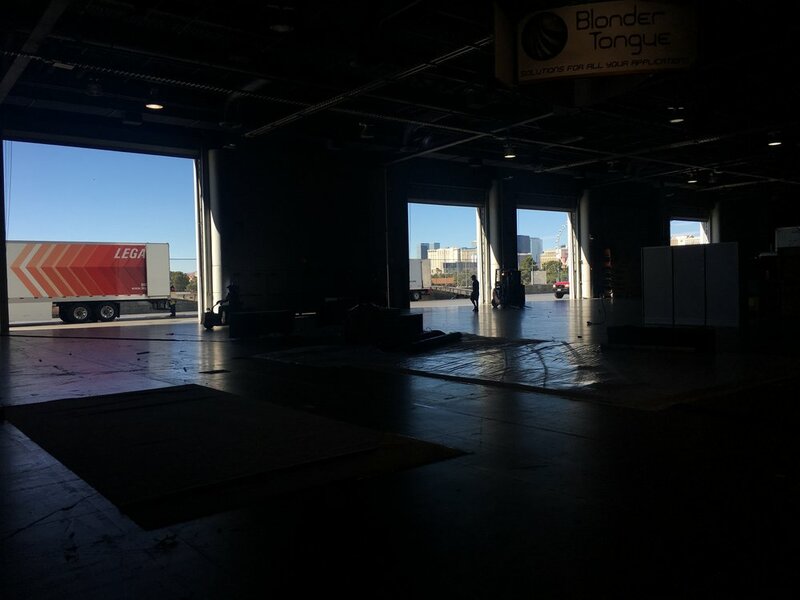 The tables arrived, the plastic wrap has been removed, the booth babe is here and we're ready for the show! The first presentation happened just an hour after the show opening, filling the ottomen, stools and standing room area with no problem. View from the high tables.